As part of The Economy of Living Things, a proposal for the Satellite programme 2017 by Osei Bonsu. Oscar Murillo’s work draws upon personal memories and experiences, particularly those from his home town of La Paila, Colombia. Working across a variety of media, Murillo’s practice combines painting, sculpture and video to form immersive installations composed of a variety of materials. As opposed to working within a specific spatial environment, his work evolves from a far ranging practice that includes public interventions, community-based collaborations and performance. In Murillo’s films, the locations of random activities are recorded as unedited events or occurrences. Prolonged scenes in which the camera begins to wander to reveal particular details might easily go unnoticed at first. Soon, however, the artist perspective becomes that of the viewers, opening up a tension between the direct and indirect experiences of different publics and cultures. Untitled (2017) forms part of an interconnected display of works entitled Estructuras resonantes, a meditation on the artist’s family background and history. Capturing a transformative experience, the video presents an extract from the artist’s time in Marrakesh, Morocco. 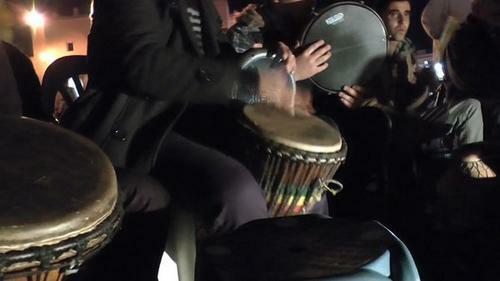 It reveals a group of North African Bedouin Arabs playing traditional music to a captive audience of locals and tourists. The improvisation of sounds, harmonies and movem ents, captures the immediate impact of live music as a form of civic engagement. Transcending cultural boundaries, the performance places the viewer at the centre of an experience of aesthetic absorption and rupture. Oscar Murillo earned his BFA in 2007 from the University of Westminster in London, and completed his MFA in 2012 at the Royal College of Art. Murillo’s works and projects have been the subject of solo exhibitions at prominent institutions worldwide. Most recently, presentations were held in 2015 at the Museo de Arte de la Universidad Nacional de Colombia, Bogotá; Centro Cultural Daoíz y Velarde, Madrid (part of ArcoColombia 2015); and Artpace, San Antonio, Texas. In 2014, Murillo participated in numerous international group exhibitions, including at The Museum of Modern Art, New York and the 1st International Biennial of Contemporary Art of Cartagena de Indias, Cartagena, Colombia. The exhibition is co-produced by the Jeu de Paume; the Fondation Nationale des Arts Graphiques et Plastiques and the CAPC musée d'art contemporain de Bordeaux. The Friends of CAPC contribute to the production of works in the Satellite programme. + Satellite programme 2017, "The Economy of Living Things"